Here’s a short list of my favorite “Old School” Direct Marketing books. They include books on Advertising, Direct Marketing, and even Copywriting. And most of them were written decades ago by a bunch of “Old Geezers”, including several that were written in the 1920s. Some of you may be wondering why an Internet Marketer would even care about these “Old Geezer” books when all of them use old school print ads and direct mail pieces as examples and case studies (which really were the only choice when these books were written as far back as the 1920s). Internet Marketing IS Direct Marketing. And these books were written by the Masters of Direct Marketing! I’ve been enjoying these books for so long that I’ve had to buy new copies of them repeatedly over the years because I either lost my copies, wore them out, or someone borrowed a copy and never returned it. The good news is that most of these “Old School” books can be found at any online bookstore like Amazon.com for less than twenty bucks. These 12 books are more than enough to get you started and to help you start an “Old School” Direct Marketing reference library of your own. I own hundreds of other books, and I can’t honestly say that I’ve read every single page of every single “Old School” book I own, because I haven’t. However, I can honestly say that I keep these books and dozens of others just like them next to my desk and I refer to them for inspiration whenever I need to write headlines, ads, or sales copy of any kind. These books are pure gold and I hope you enjoy them! Here’s the best “learn how to write great copy” training program out there. Some of these books are in the “public domain” which means anyone has the right to publish them and charge whatever they’d like. So before you buy the first copy you see… search around and find the best deal. You’d be surprised how easy it is to find alternative copies for pennies on the dollar. Don’t forget to check Amazon.com and even ebay for used copies in great condition; you can save a bundle on each book that way. Since some of these books are in the “public domain” you may be able to find free PDF copies of them on the Internet that are perfectly legal copies for you to own. Amazon has dozens of these types of “Old School” books in their Kindle store, and they either give them away for free, or they charge as little as 99 cents (even when they also sell print book versions of the same book for $20 or more). So be sure to check for Kindle versions as well. Dozens of these types of books are actually out of print and are almost impossible to find so you may see copies of them selling for hundreds of dollars on Amazon or ebay. But don’t buy the first copy you find, be sure to search around using some of the tips I offered above. 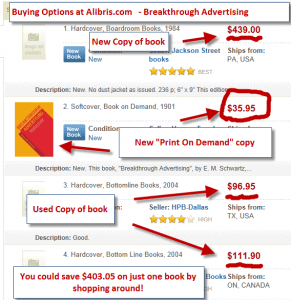 You could save $403.05 on Breakthrough Advertising Eugene M. Schwartz just by shopping around. My final and most important tip is… once you buy these books… Read Them! They are jam-packed with great ideas and proven swipe copy, including… Headlines, Full Page Magazine Ads, Direct Mail Sales Letters, Classified Ads, and thousands upon thousands of tested, proven ways to make more money with your Direct Marketing. Remember… Internet Marketing IS Direct Marketing. And every successful Internet Marketer I know, especially the ones that stick around for the long run, is a lifelong student of Direct Marketing! Great post, very informative. I too have several old Direct Marketing books and they are full of useful information. Also as you said there are some great titles which are now in the public domain. Thank you, you do great job giving condensed valiuable informations making my life easier. You do this in emails and on your sites. I let myself save this article to keep it in my “Resources” folder on desktop, hope you don’t mind, it is for my personal use. Your informative emails I used often and keep them in “Training” folder. Do you know (by chance) how transfer foolder from Yahoo emails program to permanent place on my computer ? Sorry, I don’t use yahoo but you should be able to just “save as” or copy the files to save to your folder. Thanks for the feedback! I like the list of your “old geezers”. I will endevour to pick up a few of them on Amazon, or eBay or some secondhand bookshops in town. I am responding also to your “last email”, email that you sent to me. I am a little surprised that you would consided “deleting” emails off your lists. OK, I have not bought any of your programs, as at this moment in time I have a tight budget, but if you delete some non resposive email “customers”, are you cutting yourself off from prospective sales? i’m merely cleaning my list up by removing emails that don’t seem to be “active” anymore… as in they were abandoned. Thanks for checking it out! Wow!! Jeff you gave us a great tip in suggesting that when searching for a book we first go to … Amazon.com. Do you really think we are all idiots and have never used the web? Trying to offer friendly advice based on personal experience does not assume the person you are helping is an idiot. Thank you Jeff. This is really useful. Not sure that this counts as old enough, but Drayton Bird’s 1982 classic Commonsense Direct & Digital Marketing keeps on getting new editions. Drayton – now 76 – is something of a legend in direct marketing circles – he wrote American Express’s direct mail letters. Thanks, I already own that one and it’s definitely worth checking out. Because what use is your traffic, if you can’t write the damn ad?